What I love about being a destination wedding photographer is having access to the world’s MOST breathtaking destinations AND getting to experience it with our amazing couples. Our team has traveled near and far photographing dozens of beautiful weddings over the years and I thought I’d share some of my favorite wedding destinations with you. While there are a lot of destination wedding hotspots in the Bahamas, Maldives, and Paris (we have nothing but love for these ever-popular locales! 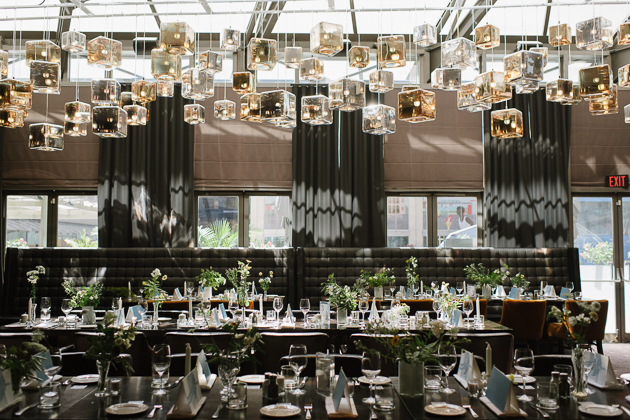 ), we discovered an array of gorgeous under the radar venues that are sure to leave you and your guests in awe. Set your sights on hidden gems like Castello di Vincigliata and SALA Phuket. Not only will you enjoy a unique celebration, you’ll also end up with the most breathtaking wedding photos! Just be sure to book your venue (and your destination wedding photographer 😉 ) soon, because these stunning locations won’t stay secret for long. This luxury Riviera Maya beachfront resort is a true gem. Set in an airy Mexican landscape with private villas, some of which feature thatched roofs. Exchange your vows in the lush tropical garden and celebrate under the stars on the resort’s beautiful patio. With its custom made furnishings and local art on the walls, Belmond Maroma offers a true luxury experience. Photographer’s Notes: Although it was raining at Roxy and Raghu’s beautiful wedding day at Belmond Maroma, you couldn’t tell from photos. Lush trees protected the bride, groom and their guests from the rain while the quiet tapping of raindrops lended for a magical atmosphere. Truly unforgettable! SALA Phuket Resort and Spa is a magical mix of adventure and leisure. Spend the morning learning to surf at a white sandy beach, exploring (perhaps even ziplining through) the lush rainforest and the afternoon chilling on the sand with a tropical cocktail. With its mix of sleek contemporary architecture, Thai decor elements, palms, and beach makes Phuket a perfect sun-kissed spot for couples who love the sun, sand, and water! Photographer’s Notes: I took Teresa and Louis to the beach for their First Look photos. 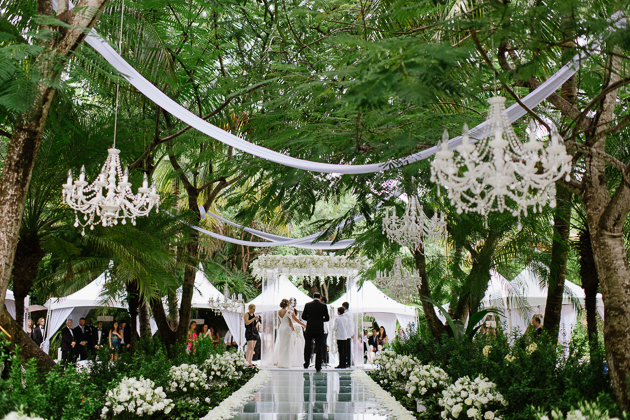 It gave me goosebumps seeing Teresa walk through a narrow path under the tall palm trees in her gorgeous Vera Wang dress – that’s how beautiful she was! As she approached Louis who was blindfolded for their First Look, she tapped his shoulder, Louis turned, took off his blindfold and planted a kiss on Teresa’s delicate hand. It was pure magic! Distance yourself from the hordes of tourists in Florence and wed at the top of the hill at Castello di Vincigliata. 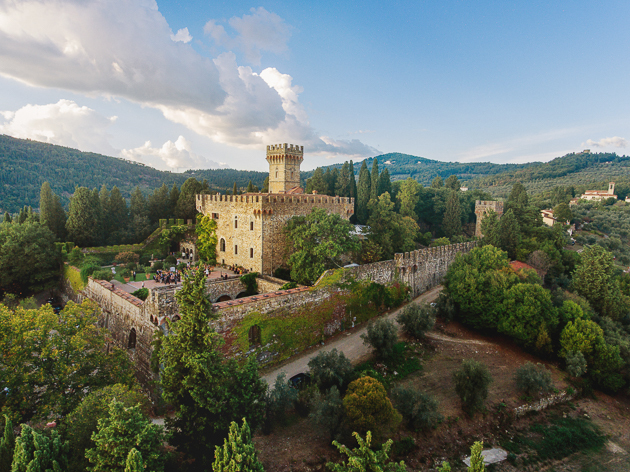 A magnet for architecture enthusiasts, this Florentine gem is a true medieval masterpiece with sweeping views of the rolling Tuscan hills. Its old world charm, aged cobblestone, and fantastic views make it a wonderful sight for getting hitched. 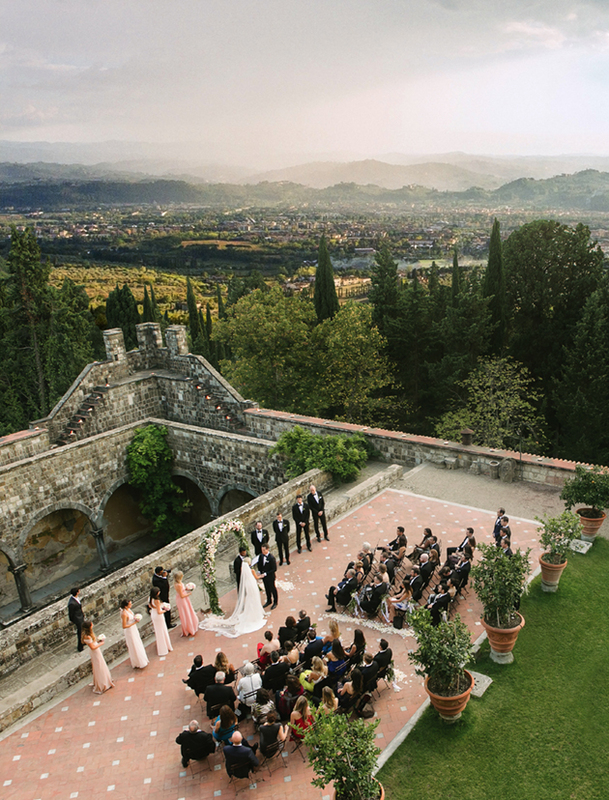 Photographer’s Notes: Erin and Winston wed on top of the hill at Castello di Vincigliata surrounded by their dearest and nearest. I was so inspired by the majestic Florentine views and the medieval architecture of the venue, I really wanted to let them take center stage in their ceremony photos. As Erin made her way through the ceremony aisle, my second photographer rushed to the castle’s tallest tower to take the bird-eye view of the setting. This photo is one of my all-time favorites! So much has been written about the beauty of Greece. Its blue coast and ancient architecture are brimming with such historical and natural splendor. Island Art & Taste in Athens is one of my all-time favorite destination wedding venues because it gives me an opportunity to experience the beauty of Greece. Located right on the seashore it retains a rural Greek ambiance. With its stunning vistas of the sea, hiking trails, dairy farms, blooming gardens and rolling hills within reach it’s ideal for an outdoorsy getaway. So, after a full day of adventure, you can rev up the romance at your perfect Greek Wedding. Photographer’s Notes: You would never guess, but I took this photo of Cindy and Terry on the following day after their wedding! I really wanted to take advantage of the magical golden light at sunset and taking their photos without the strict wedding timeline. Cindy and Terry got to be a bride and groom just for one more day and relive their Just Married moments with the epic sun setting below the horizon. One word: Perfection! 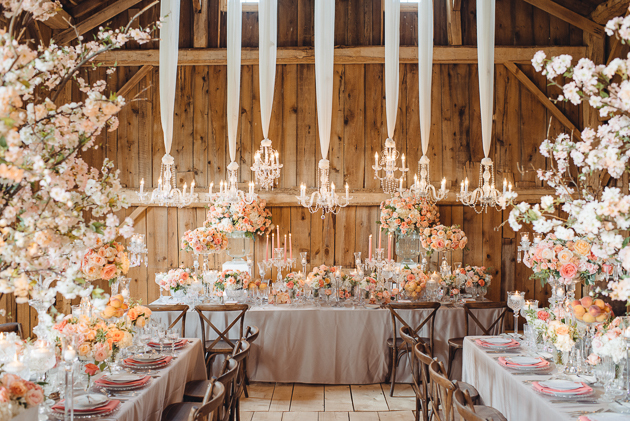 Hampshire is a county on the southern coast of England and the ever-so-majestic Four Seasons Hampshire is a 500-acre country estate perfect for a wedding fit for royalty! Its beautiful architecture attracts stylish couples from all over the world, but it has so much more than just a pretty facade. It’s unassuming in an almost hypnotic way with its lush green fields, narrow lanes, century-old trees and horse ranch. Its laid-back vibe seems to induce a sense of calm in everyone who visits. No wonder so many of our couples choose to wed there! Photographer’s Notes: It’s only natural that architecture and photography go hand in hand. Your wedding setting is such a big part of your day and I really want to make sure it’s given proper credit in your wedding photos. Agnes and Richard wed at the fabulous Four Seasons Hampshire and we spent their wedding day afternoon exploring all the goodness the estate had to offer. I immediately fell in love with this photogenic corner of the garden. Paired with my inspiration and the couple’s curiosity to explore, we ended up snapping the cutest photos! I hope you enjoyed this post! 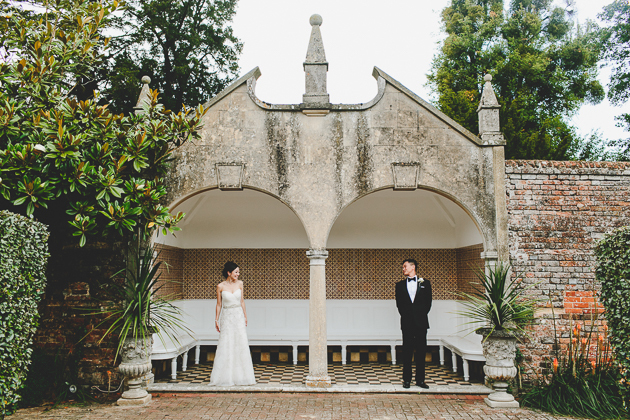 Did you know we now have a local destination wedding photographer in Miami and Mexico? Contact us here to book your destination wedding photography! QUIZ: Find Out Which 2019 Wedding Dress Trend Is The One For You!From whimsy boho to sleek and modern, which dress style will you choose? Top 11 Most Beautiful Churches in Toronto To Get MarriedYou’ll think your in Europe when you see some of the cathedrals on this list!